Sheri Ann Richerson is a leading pioneer in the self-sufficiency movement. For the past 19 years she has been living, teaching, and promoting organic gardening, natural health and self-sufficiency through all forms of media. Her career includes years as a nationally acclaimed best-selling author, radio host and guest on a variety of shows – showcasing her expertise on homesteading and gardening. Additionally, Ms. Richerson is a speaker, columnist and a blogger for hundreds of websites, magazines and newspapers. Ms. Richerson has been featured in The New York Times, Woman’s World Magazine and Ladies’ Home Journal. Her by-lined articles can be found at idiotsguides.com, Learn2Grow.com, Suite101.com, SFGate.com, eHow.com, GardenGuides.com and dozens of other sites. Ms. Richerson has contributed to a wide range of anthologies as well. Her writing credits include contributions to “Our Food Heritage, Past, Present, Future, Baking Bread Together, Helps to Keep the Family Together” – 2007; “Llewellyn Herbal Almanac” – 2006, 2005 and 2003; “Llewellyn Magical Almanac” – 2006, 2005, 2004 and 2003; “All Things Chocolate” – 2005; “Llewellyn Witches Spell-A-Day” – 2003; “Llewellyn Moon Sign Book” – 2002. •The Complete Idiot’s Guide To Year-Round Gardening a #1 best seller. •The Complete Idiot’s Guide To Seed Saving & Starting a #1 best seller. •Flower Gardening: A Collection Of Articles By Sheri Ann Richerson a #1 best seller. •Growing Plants In What You Have a #1 best seller. 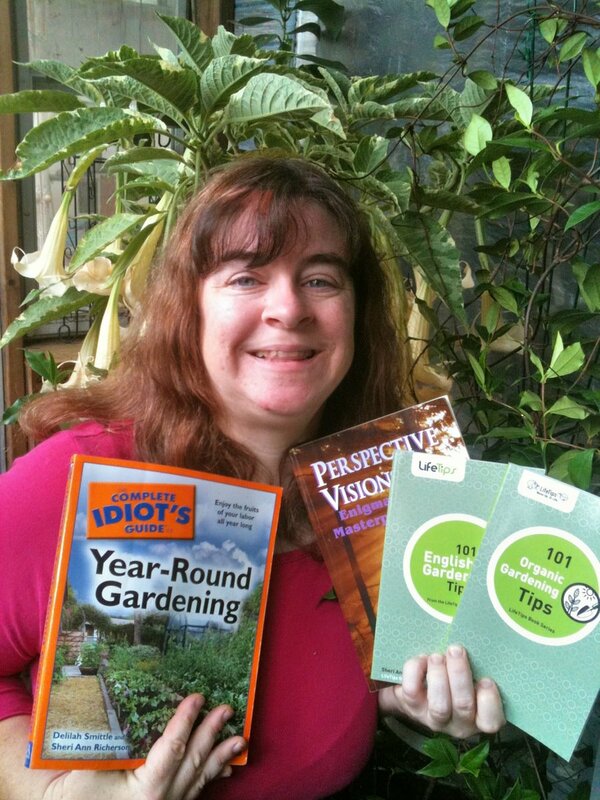 •101 Self-Sufficiency Gardening Tips a #1 best seller. •101 Secret Gardening Tips a #1 best seller. •The Allure Of Chocolate a #1 best seller. •Growing And Harvesting Edible Plants: A Collection Of Articles By Sheri Ann Richerson a #1 best seller. •An Herbal Meal For The One You Love a #1 best seller. • Houseplants, Cacti And Tropical Plants: A Collection Of Articles By Sheri Ann Richerson a #1 best seller. •Herbs For Rock Gardens & Ground Covers a #1 best seller. •Magical Gardens a #1 best seller. •Herbal Hydroponics a #1 best seller. •Wishing Herbs a #1 best seller. •101 Organic Gardening Tips a #1 best seller. •Scented Gardens: A Collection Of Articles a #1 best-seller. •101 English Garden Tips a #1 best seller. •From Seed To Harvest a #1 best seller. •101 Beginning Gardening Tips a #1 best seller. •Fire Magic a #1 best seller. •Legend Of Fire a #2 best seller. •Healing Properties Of Water a #2 best seller. •The Monkey Man Of India: A Figment Of Imagination Or A Fact? a #2 best seller. •Ghosts Of Key West a #2 best seller. •Natural Health And Wellness: A Collection Of Articles By Sheri Ann Richerson a #3 best seller. •Wedding Superstitions a #4 best seller. •Urban Legends a #14 best seller. •Fairy Dance a #15 best seller. •Jervacia’s Last Stand a #19 best seller. •Darkness a #28 best seller. •Dark Abyss a #34 best seller. Her farm, Exotic Gardening Farms, is a certified wildlife habitat. She is a Global Warming Ambassador for the National Wildlife Federation and a Region III Representative for the Plant-A-Row for the Hungry program. Her diverse range of writing and speaking has included an eclectic mix of articles on current events, herbs, aromatherapy, tropical plants as well as various pieces on Harley-Davidson motorcycles. Ms. Richerson has given numerous talks on a wide variety of subjects including chocolate, night blooming plants, seed starting, herbs and global warming. Her specialty topic is Theobroma cacao commonly known as chocolate. Ms. Richerson attended Ball State University and Huntington University, where she majored in communications and minored in theatrical arts. Sheri lives in Marion, Indiana. For more information, please visit her writing website at SheriAnnRicherson.com, her gardening and homesteading website at https://experimentalhomesteader.com or subscribe to the Experimental Homesteader podcasts on iTunes.